Personal development is an ongoing process. As humans we all strive to get better on daily basis. It is about getting better daily. How does it helps in achieving success? Personal development allows us to see inside ourselves and grow daily. It is about knowing your own capabilities. It is about having confidence in ourselves. We measure our success from the view point of others.What others think about us ? If I do this, how does it affects my relationships ? Does my lifestyle have a positive effect on how people think about me? Okay okay. All these are the questions you will have regarding your personal body, lifestyle or whatever. At some point of time in our lives, we get to surpass them. As teenagers and in early twenties, it is more about looks and fulfilling dreams. Most of those dreams are defines by others. Say our parents or family members. Our thoughts about our body is also according to the taste of our friends and people around us. When I was in college, One of my roommate had 24 inches waist. I tried a lot to achieve that. But could not. My mother used to tell me that it is your body. You cannot be like her. But I never listened to her. Now I have 26 inch waist. And I am not happy about this.Because everybody in my age group has put on weight. I am the opposite. At that time also I was being told that I am short and bit heavy. Now everybody say “O my God what is wrong with you”. This is so hilarious, one of my friend saw my picture and asked “is something wrong with you”. I know she didn’t used the straight forward words but she wanted to know whether I have got some serious illness. Then as you go into jobs or businesses, you start family, questions change. But the real thing pleasing others doesn’t change. You never sit and think about personal development. It is what you think about your self and your happiness. Sit with your self and ask some questions to your true self or soul, whatever you would like to call. Does it matter if I look this way or that way? How can your physical personality affects your relationships? Does it matter to your friend what you do or how much you earn? I don’t think so it really matters. The only catch is your thoughts. You don’t believe in your self. You are a capable being. But you are ignoring your own virtues. God has given you some gifts. Some people have more qualities and some have few. But it is up to you to know your capabilities and start working towards them. You cannot do it in one day. If you think like you read a book and it can do a magic. No. Sure books have impact on our lives but only if we follow the advice. Sometimes the advice may not align with your goals. Don’t worry. You will always find something inspiring in every motivational book. So read good books. Have you ever thought how your life float like a leaf in air. You (the leaf) tend to go in the direction of life( the air). You don’t even realize where you are going. It is like waking up in the morning, rushing for the morning stuff and heading for work. Setting goals will lead your life into the direction you want.Now you have daily goals, weekly goals , monthly goals.Goals should be about your own empowerment. Spend time at work, come home, watch TV, have dinner and go to sleep. Oh no. You even don’t get time to think about your self. Change this. Even if for 10 minutes. Sit have notebook and write about your goals. What you want to achieve with your’ NOW.’ Because this is the moment you have. You and me will be in same boat after few years. 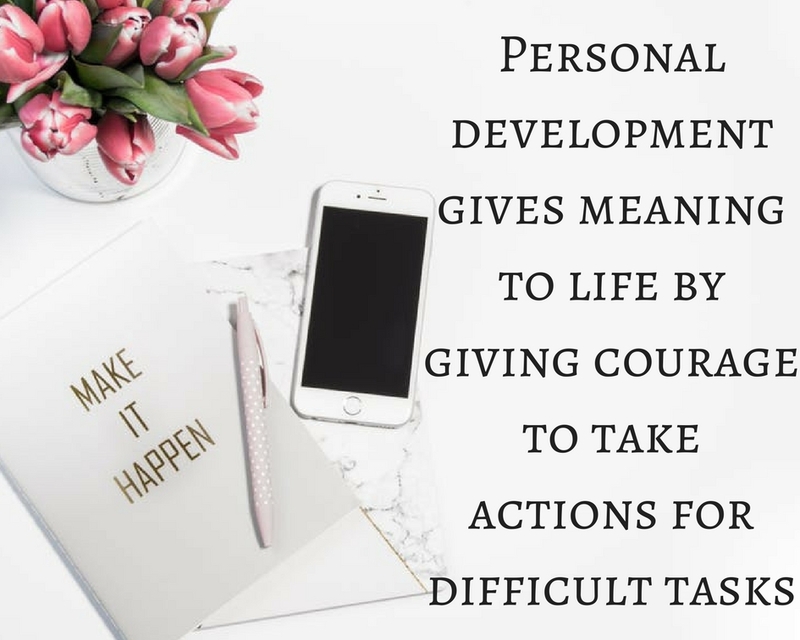 It is important to start developing personally. It is about setting some goals for life. Accomplishing them and having spare time to do those things you wish you could have done. When you are on the path of personal development, you stop judging yourself from other’s parameters. Now you know your worth. It is like having a mind map of your own capabilities. You are not competing world, rather you are your own competitor. This competition is not a worrisome one. It is a healthy competition of raising your own beliefs about your own self. Yes, personal development helps in achieving those dreams and goals which are always in mind. But you are afraid to take action. You get uncomfortable on the thoughts of failure. As you gain confidence in your capabilities , you stop fearing. And start doing things that are difficult but you want to accomplish. When you are going on the path of personal development , you are more aligned to your own happiness. You know when to stand up for your self. Your actions are not always guided by others. Now you know what you want from life. It is not something selfish. But improving your inner self. It is an investment in your own self. When you know you have courage , you know what is happening around you. You sense the time which is going. Instead of anxiety and worry, you are more at peace. Because you know that you are not worried about your future. You can handle tough times. Do one thing everyday that scares you. ELEANOR ROOSEVELT. This is the most important thing you can do for personal development. It will help you in throwing away your fears about your own self. And embracing your powerful self. When you go through the process of personal development, you have clear mind to take actions. You stop being the slave of only thinking. You get the clear picture of what you want and why. And as it is said, when why is clear, how doesn’t matter. Taking actions for accomplishing your dreams give meaning to your life. Your actions could be empowering your self spiritually, financially. It could be about your relationships. 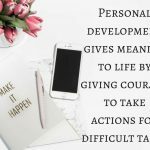 What do you feel about personal development. Please share in comments. I love this! This is such a positive way to start my saturday when the world seems to have turned to dirt…! Great article and great blog. Thank you Suz for your kind words and comment.